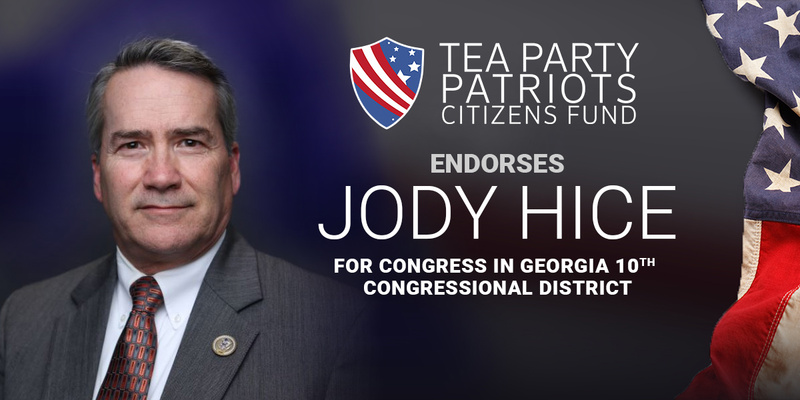 ATLANTA, Ga. – Tea Party Patriots Citizens Fund (TPPCF) Chairman Jenny Beth Martin today released the following statement, announcing that the Super PAC associated with the nation’s largest Tea Party group has endorsed Jody Hice for Congress in Georgia’s 10th congressional district. “For conservatives in Georgia’s 10th congressional district, the choice is clear – Jody Hice for Congress. “Since coming to Congress after the 2014 elections, Jody has been a strong constitutional conservative. He became a member of the House Freedom Caucus, and, after the 2016 elections, joined its board. He has regularly fought to live up to the conservative values and principles on which he campaigned, even when that required him to stand up to the party leadership. “Jody was outspoken in his demands for the impeachment of IRS Commissioner John Koskinen, who oversaw the destruction of evidence under congressional subpoena and spent years stonewalling Congress’ demands for more information regarding the investigation of the IRS’ decision to target conservatives for their political beliefs. “Jody is an avowed opponent of excessive government spending, and demonstrated that most recently when he voted against the $1.3 trillion omnibus spending bill.